Be Known for Something : Discover Your Church Communication Thread / Random Thoughts / Missed Catalyst? 9 Important Things you Missed! 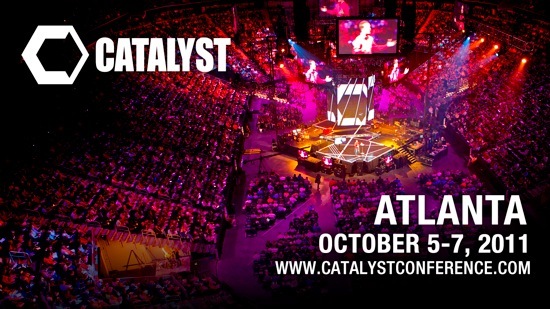 Just got back from Catalyst — the premier Christian Leadership conference in Atlanta. 13,000 people, 2-days and so many challenges. Challenges: the good kind. The ones you listen to and realize that what you just heard will change you. If you do something with them! The Conference theme was “Be Present”. And I was. Now I want to “Be Motivated” to work on these things. Pouring through my notes, and starting with a BUNCH of important things that I learned; I narrowed them down until I found 9 things that changed me. “Set a 20-mile march and stick with it” — Jim Collins. Most leaders who succeed in doing something extraordinary set a pace (goal) and stick to it. No matter what. “What are you going to do with the Dash” — Dave Ramsey. On your tombstone, you’ll have your birth date and your death date — with a dash in between. What you do with the Dash is the most important thing. “If we had the Transcripts of our prayers from the last Year; what would the theme be?” — Francis Chan. He contends that God doesn’t always listen to selfish prayers. “We need to reset our worst case scenario” — Mark Driscoll. If death is “being with Jesus”, how can it be the worst case scenario? I ended the conference by purchasing tickets for next year. And hopefully in 12 months I’ll be a changed person as I put these into practice. Join me next year. Only if you want to be challenged!